On Oct. 16, 2016 Eta Omega Zeta held a Breast Cancer Awareness Program during Greater Bethel A.M.E. Church morning service. 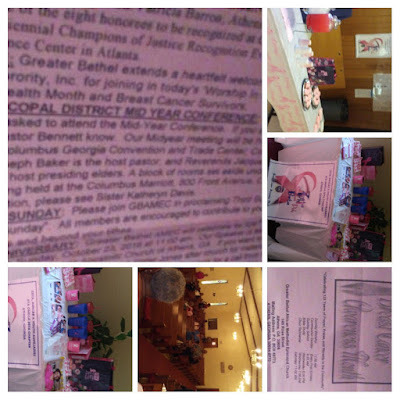 Soror Kathryn Davis gave the congregation facts about breast cancer. After service there was a reception in the fellowship hall. A table was set up in the vestibule of the church with brochures on breast cancer and the effects of cancer in general, as well as some freebies.. Each person attending service receive a pin to wear with either hope, faith, courage or survivor on it. The members was asked to wear pink on that Sunday. The breast cancer survivors answered questions they felt comfortable in answering.